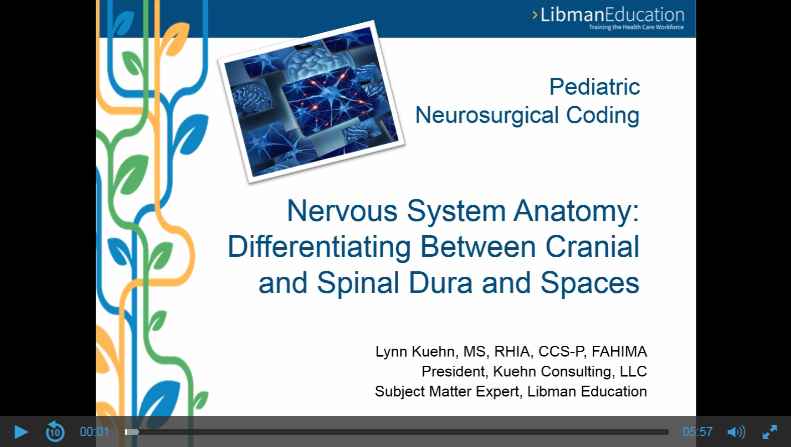 Hear nationally recognized ICD-10 expert and Libman Education course author Lynn Kuehn, MS, RHIA, CCS-P, FAHIMA, discuss Pediatric Neurosurgical Coding: Differentiating Between Cranial and Spinal Dura and Spaces in this free, brief presentation. Need comprehensive and complete pediatrics coding guidance? Then consider Libman Education’s Pediatrics Coding Suite — authored by nationally recognized coding experts Lynn Kuehn and Gail I. Smith! Learn more here.